Zanzibar often takes the limelight for its beautiful beach retreats on the Indian Ocean; however there are some real hidden gems on the mainland coast of Tanzania and also the adjacent islands of Pemba and Mafia. Zanzibar's beautiful beaches really attract the crowds but the mainland coast offers a much quieter and more remote setting. 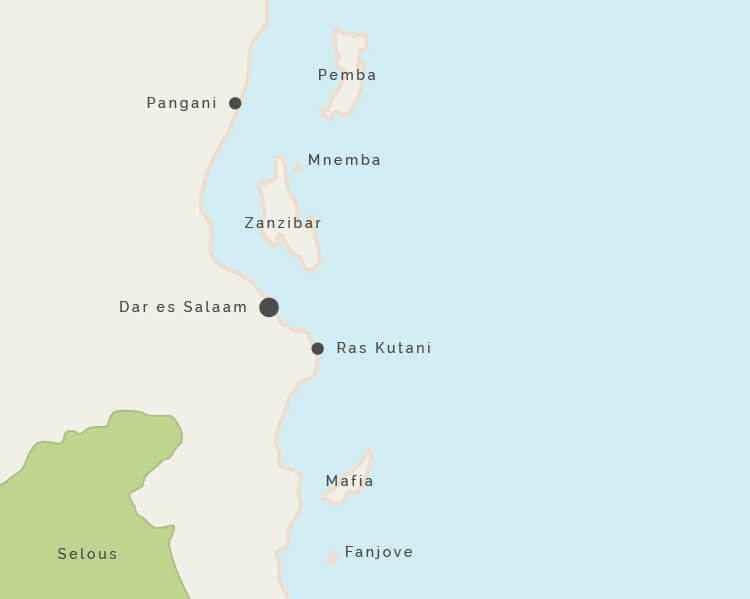 The mainland Tanzanian coast has a few spots that are well worth visiting, the beaches south from Tanga offer soft white sands and some good dive and snorkel locations. A 15-minute flight south of Dar es Salaam is one of the best beach hideaways in Tanzania and one of our absolute top favourite properties, Ras Kutani. This is barefoot luxury at its very best, a beautiful spot to really relax and recharge. The islands of Pemba and Mafia just off the coast of Tanzania are less well-known than Zanzibar but offer some fantastic unspoilt reefs for diving and snorkelling - although their beaches are arguably not as good as Zanzibar's. Much more remote and less visited than Zanzibar, these are real tropical islands with thick undergrowth and great reefs and sand spits making these islands ideal for diving and snorkelling away from the crowds. Beyond the main island of Zanzibar main island, Pemba Island is just a 30-minute flight north, and Mafia Island is 45 minutes south. Both primarily diving locations, their beaches do not compare to Zanzibar's, but these are fine options for keen divers who wish to avoid the crowds and enjoy thriving coral reefs. Also Fanjove is the new star - a private island for the cost of a normal Zanzibar lodge. We don't just know Zanzibar and Tanzania!